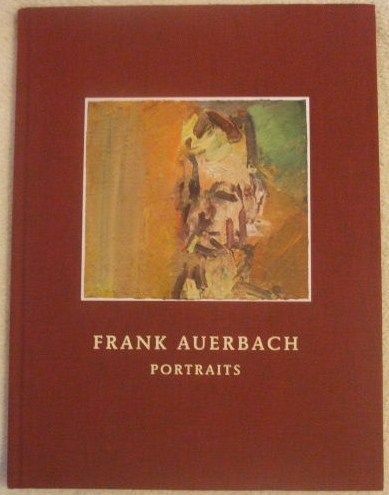 First edition, first print hardback of FRANK AUERBACH PORTRAITS Exhibition Catalogue. Published by Ben Brown Fine Arts, 2013. This is the artist Frank Auerbach's first Asian solo show Exhibition Catalogue (Held from 22 May to 10 August 2013, by the Ben Brown Fine Arts Gallery in Hong Kong) titled “Portraits” which gathers paintings and drawings, the only mediums used by the artist since the 1970s. The book is in near fine condition (clean maroon cloth boards with blocked colour print on front and gilt lettering on the front and spine) with only very minor shelf wear. Without a dust jacket as issued. Internally, the pages are clean and tight and there are no tears and no inscriptions. Frank Auerbach was born in Berlin to affluent Jewish parents in 1931, his father a lawyer and mother an artist. At the age of eight he was sent to England under the Kindertransport programme, which sent Jewish children to foster families and boarding schools in England to escape the Nazi occupation. His parents remained in Germany where they subsequently died in concentration camps. Auerbach’s work has been exhibited at the Hayward Gallery, London; Rijksmuseum Vincent van Gogh, Amsterdam; the Yale Center for British Art, New Haven, Connecticut; Kunstverein, Hamburg; Museo Nacional Centro de Arte Reina Sofía, Madrid; the National Gallery, London; the Royal Academy of Arts, London; and the Courtauld Institute of Art, London, among other institutions. Auerbach himself rarely leaves Britain, and has lived and worked in the same London studio since the 1950s. "Frank Auerbach, one of Britain's most accomplished living artists, had his first solo exhibition in Asia at Ben Brown Fine Arts in Hong Kong from 22 May 2013. By concentrating solely on a select group of portrait paintings and drawings, from the 1970s to the present day, this exhibition demonstrates the remarkable insight of a famously hermetic artist. Running concurrently at the gallery with the exhibition NOT VITAL: Landscapes, both shows will open during Art Basel Hong Kong. At the age of 82, Auerbach is one of the few remaining British painters of his generation, which included his close friend and colleague Lucian Freud. For more than fifty years Auerbach has worked in the same modest studio in north London with diligence and an almost monastic absorption. Most of Auerbach's models have been sitting for him for decades, and so his oeuvre serves as an extended meditation on a select coterie of subjects. Included in this exhibition are portraits of his son Jake, his wife Julia, art critic William Feaver, curator Catherine Lampert and businessman David Landau, all of whom faithfully sit for him on a regular basis." 36 pages including 12 colour illustrations.